If you don't want to roast your own beetroot, use ready-cooked roots (but not pickled beetroot), sautéing the halves or quarters in a little olive oil before serving. The flavour, though, won't be as intense or as sweet. Add boiled waxy potatoes to make the dish more substantial. To make the dressing simply mix all the ingredients together. Taste and adjust the seasoning (you may want it slightly hotter or sweeter), then chill until ready to serve. Preheat the oven to 190°C, gas mark 5. Trim the beetroots, leaving some of the stalk attached. Drizzle a little olive oil over them, wrap in foil, put in a small roasting tin and bake for 1-½ hours, or until tender. While still warm, rub or peel the skins off. The beetroot will stain your hands, so wear clean rubber gloves, or work with a fork and sharp knife. Cut the beetroot into quarters or halves, depending on their size. Break up the salmon into large flakes, or leave in individual fillets, as you prefer. Discard the skin. Toss the spinach with the extra virgin olive oil, lemon juice and some salt and pepper. 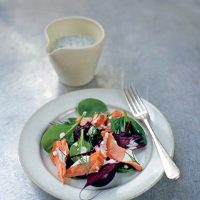 Divide between 4 plates, add the salmon and beetroot and drizzle over the dressing. Serve straight away.